As a life-long avid reader, books have always been my favourite gift either to give or to receive and those which inspire travel and curiosity about the world are my absolute faves. To help with your holiday shopping here are my recommendations of great fiction and non-fiction books for travelers of any age on your list. The Travel Mamas' Guide by Colleen Lanin from the popular Travel Mamas website provides both inspiration and practical advice on how to vacation with babies and children...and stay sane! The book makes a great gift for any parent or caregiver of babies or young children who needs reassurance that traveling with kids is possible and who is looking for practical tips and planning information to make the experience a smooth and enjoyable one. Know someone planning a trip to Walt Disney World or taking a Disney cruise in 2015? If so, The Unofficial Guide: Disney World with Kids and The Unofficial Guide: Disney Cruise Line would make excellent gift choices. The guidebook authors are completely independent of Disney so can always be counted on for honest advice about the resorts, attractions, restaurants and cruise ships and the books are packed with all the information one needs to have a successful Disney vacation. The travel memoir We'll Always Have Paris , by bestselling author Jennifer Coburn, is the captivating story of a mother taking her daughter on several trips to Europe to create special memories...just in case. This is a great read for those who love to travel as well as those who love a good mother/daughter story. Parents either contemplating traveling with children for the first time or looking for some tips to improve their travel experiences will appreciate a copy of The Family Traveler's Handbook by award-winning writer Mara Gorman. The book is a great resource that inspires families to explore the world and provides them with the tools to do it successfully. The Cruise Traveler's Handbook by Gary Bembridge is a great resource - particularly for first-time cruisers. The guide answers every question would-be cruisers could possibly have (as well as a few they would never have thought to ask). The book is a must-read for first-time cruisers and would also make an excellent holiday gift. It has been almost three years since I read The Sweet Life in Paris by David Lebovitz but it still ranks as one of my favourites. The book relates humorous anecdotes about the adventures of an American pastry chef living in Paris and includes a delicious-sounding recipe at the end of each chapter. This is a wonderful book for the fan of memoirs, the francophile or the amateur chef. Have Mother, Will Travel by Claire and Mia Fontaine is another travel memoir that makes a great gift choice especially for women. Traveling along with Claire and Mia as they experienced new places appealed to the traveler in me but I think it was witnessing the transformation in the two women and their relationship as they got to know each other and themselves better that made the book impossible to put down. One of the great series of books for getting kids excited about travel is the Lonely Planet's Not-for-Parents series intended for kids ages 8 and up. We love The Travel Book which is jam-packed with geographical information about all the countries of the world as well as the individual city and country guides which are illustrated like a graphic novel. The list of guide books includes cities such as London, Paris, New York, and Rome as well as countries and continents such as Asia, Africa, Australia, Europe, Great Britain, China and the United States. Girls between the ages of 7-10 will love the Agatha: Girl of Mystery series written by Steve Stevenson about a young detective who jets around the world to solve mysteries in places such as Egypt, India, Scotland, Niagara Falls, Scotland, Paris and Venice. My tween daughter loves the Mira's Diary series by Marissa Moss. In the first book, Mira receives a cryptic post card from her missing mother and heads to Paris to try and find her. Mira discovers that she is looking in the wrong century and travels back through time to change history and try to bring her mother home. In subsequent books Mira searches for her time-travelling mother in 16th century Rome and in London during World War I. Kids that like graphic novels and comic books will enjoy the Thea Stilton series. Thea is the younger sister of the title character in the best-selling Geronimo Stilton series of books for kids ages 6-12. Thea's adventures take her round-the-world to places such as New York City, Paris, Japan, Alaska, Scotland, and the Netherlands just to name a few. The 39 Clues is a series of adventure books written by a collaboration of authors about orphaned siblings Amy and Dan Cahill who discover upon the death of their grandmother that they are part of a family that has shaped world history. Their quest to find the clues that will lead to the source of the family's power lead them on a round-the-world treasure hunt. KeeKee's Adventures is a wonderful picture book series about an adventurous calico cat who travels the world in a hot-air balloon. Thus far, KeeKee has visited Paris, Rome, and Athens, Greece. The Adventures of Bella & Harry is a picture book series about two adorable chihuahua pups who are traveling the world with their family. The siblings have visited a long list of places including London, Rome, Paris, Barcelona, Dublin and Vancouver. Czech artist and illustrator, Miroslav Sasek, published the first picture book in his delightful This Is series in 1958. Many have been reissued in recent years and a new generation of children and parents can now enjoy the series of books about many of the world's great cities and countries. Our favourites include This is London, This is Paris and This is New York. A favourite of both of my daughters when they were younger is Katie In London by James Mayhew. Katie and her brother visit London with their Grandma and are taken on a wonderful sightseeing tour around the city by a talking lion that they meet in Trafalgar Square. It's not a book but Little Passports is an award-winning product for children that is designed to inspire a love of geography, history, culture and language. 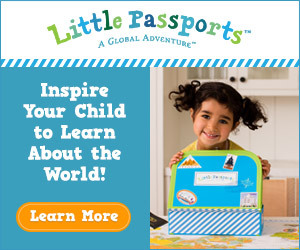 Little Passports is a monthly subscription that allows children to follow two 10 year-old characters named Sam and Sofia on adventures around the U.S. and around the world. This post contains affiliate links which means that if you make a purchase after clicking one of the links that I will receive a small commission from the sale at no cost to you. We are a participant in the Amazon Services LLC Associates Program, an affiliate advertising program designed to provide a means for us to earn fees by linking to Amazon.com and affiliated sites.